This clinic will be a fun day with interesting activities for you and your horse. And come even if you don’t bring a horse, auditing is fun, and lunch is included. A few trainers and professionals are coming together for this event, and 100% of the entry goes to the rescue. Check out the flyer and let me know if you have any questions. Sign up information below. Auditing will include hands-on massage, lunch and some interactive watching for a $15.00 donation. All proceeds go to Ruby Ranch. Participants and auditors kindly RSVP so we can plan lunch. Please come and bring friends. 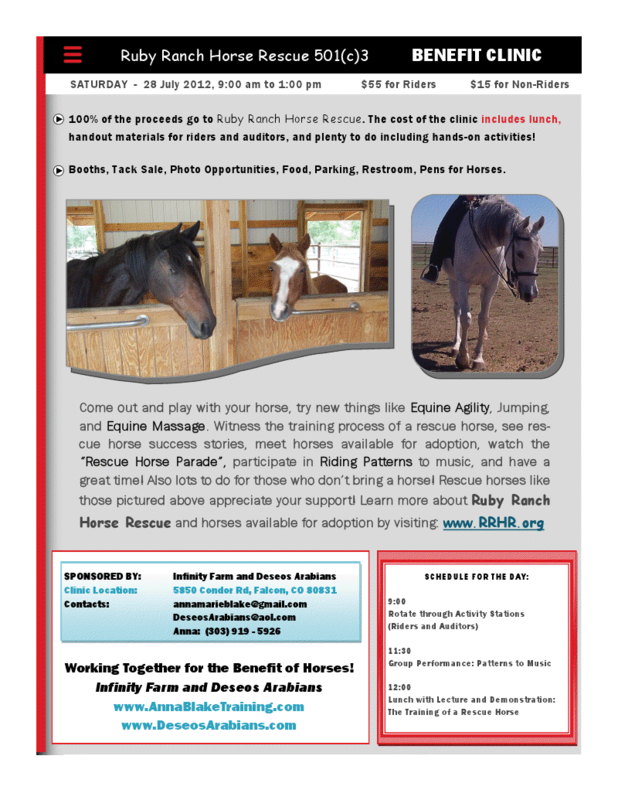 Ruby Ranch Horse Rescue is in Ramah, Colorado. Consider letting your next horse be a rescue and consider donating to the rescue in the meantime. Thank you! Lori Torrini, Deseos Arabians and Anna Blake, Infinity Farm.